The path out of poverty begins with a high-quality education for every child. And yet, thousands of Indiana 4-year-olds from low-income families lack access to high-quality pre-k. Glick Philanthropies invests in services that help low-income families access the high-quality foundation their children need for success in school and in life, while supporting efforts along the education continuum – including post-secondary education and workforce development initiatives – that build a community’s talent pool. Nearly two-thirds of young Hoosier children require child care of some type because they live in families where all parents are in the labor force; yet, Indiana’s high-quality pre-K program serves only 29,000 preschool children ages 3-5, or about 17 percent of Indiana’s total number of preschool children. 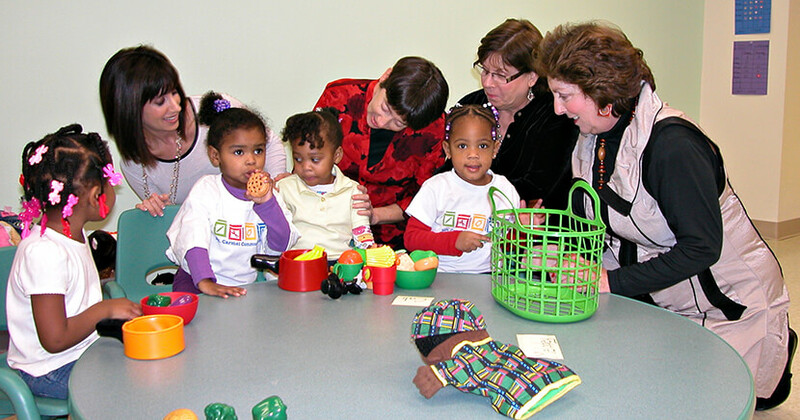 Glick Philanthropies works to expand pre-K access by funding efforts to grow the number of available high-quality pre-K seats and supporting advocacy efforts that aim to grow the capacity of high-quality pre-k providers while ensuring all existing pre-K seats system are being filled. Gene and Marilyn Glick’s four daughters and current Glick Family Foundation Board Members (L to R Lynda Schwartz, Alice Meshbane, Arlene Grande and Marianne Glick) tour the Mt. Carmel preschool on the far eastside of Indianapolis. At Phalen Leadership Academy (PLA) at IPS 103, the connection between the school, the home and the community has really come into focus. In 2015, Indianapolis Public School #103 was the district’s lowest-performing elementary school. Today, the Indianapolis far eastside school is thriving. More importantly, parents, teachers and administrators are united in forging a future vision for their students —one that helps them see beyond their current circumstances and toward one centered on education and self-sufficiency. Supported by Glick Philanthropies, PLA@103 is the Indianapolis’ first Innovation Network School — a public school that combines the freedom and flexibility of successful autonomous schools with the financial resources and services of a district school. From the school’s start in 2015, PLA@103 and Carriage House East —a Glick Family Housing Foundation apartment community where many PLA students live —have partnered together to help students and parents alike. Carriage House East regularly hosts parent meetings at the clubhouse to increase participation. Throughout the year, PLA@103 staff, along with the Carriage House East’s Services Coordinators and representatives from the Community Alliance of the Far Eastside (CAFE), make visits to homes of students to strengthen the bond between home and school and ensure students have the support they need. With Glick Philanthropies support, PLA@103 has also hired parent advocates to further nurture the school-home connection. These parent advocates visit other parents in the apartment community to keep important dates top of mind and help parents get the school resources they need for their students to succeed. In just three school years, PLA@103 — once one of the poorest performing schools in the Indianapolis Public Schools district —has gone from an “F” rating from the state to an “A” rating. That significant improvement underscores something the Glick family has long believed: Meaningful change in a neighborhood starts with affordable housing and a good school. And when the two are intertwined, the opportunity for success is even greater. The Gene B. Glick Company Scholarship is awarded annually to two undergraduate students at Indiana University’s Kelley School of Business. Gene Glick, an alumnus of Indiana University, and his wife Marilyn established this scholarship as a gift on the 50th wedding anniversary. Gene and Marilyn also established scholarships funds named after their daughters through the Wells Scholars Program at Indiana University. In addition to the Glicks’ scholarships at Indiana University, Glick Philanthropies has provided 43 post-secondary scholarships through the Eugene and Marilyn Glick Scholarship through Goodwill Industries of Central Indiana, and 31 postsecondary scholarships through the TeenWorks Scholarship Fund at Central Indiana Community Foundation (CICF).